It was a recent Thursday afternoon, and I was totally planning on attending a Young Catholic Professionals happy hour networking event. Within the last hour of my work day, I received a call. Then a text, because I typically don’t answer my phone during work. Apparently one of my housemates scored some free tickets to a free screening of the upcoming movie, When The Game Stands Tall, starring Jim Caviezel and one of those guys who got killed in The Hunger Games. I was initially conflicted because that was rather last minute and was not part my original plan for the evening. Due to having a sense of adventure, I decided to forgo going to the YCP event and go with two of my housemates plus a housemate’s fiancé to this free screening of When The Game Stands Tall. That came at the cost of hanging out with my other housemate at the networking event. You see that my struggles are real. At first glance, it looks like just another cool story of a football movie inspired by true events. But it’s particularly mind boggling that a high school team had a record 150+ win streak until the time that they lost, and this movie is about those real life struggles surrounding that time when the team endured a lot of suffering on and off the field. And. Lost. The. Streak. Again, since this isn’t a review, I want to highlight a few of the themes that stood out to me from watching this movie. I can always appreciate moments and themes in movies when the men don’t act selfishly, but rather for each other or for the greater good. No one can stand alone, but together, they are strong. And When The Game Stands Tall gave me tangible moments where this idea of brotherhood was crucial to not just be successful at football, but also a sense of brotherhood that transcends from the game. A few characters in the movie try to act in a self-centered way, but they eventually realized that it’s not all about them. With the idea of brotherhood also comes the idea of sacrifice, whereby someone surrenders their ego and humbly do what they ought to do. That’s cool. And When The Game Stands Tall gives several moments of bro-ness. This stood out to me because, in a way, I yearn for that sense of brotherhood. Luckily, I’m in a living situation where that’s about the closest thing I have. And it’s pretty cool. 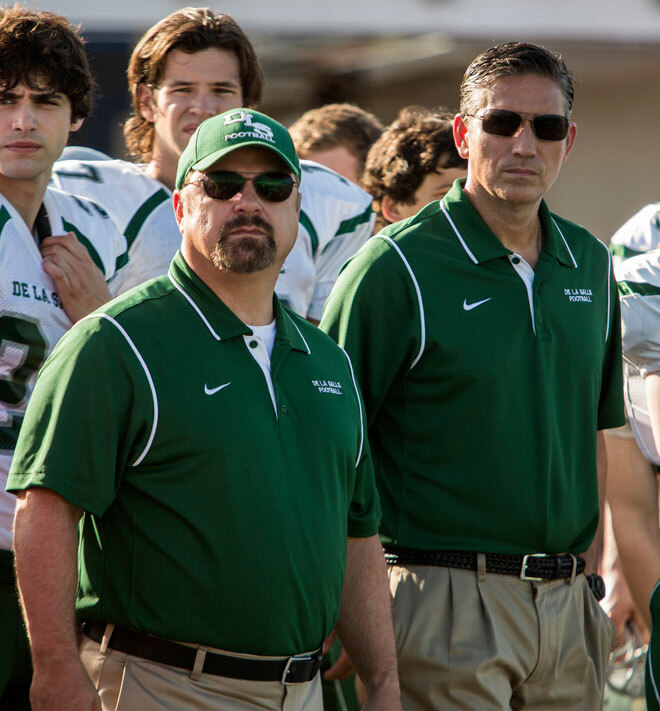 I think the overall theme of the movie, which is Coach Bob Ladouceur’s (Jim Caviezel) mission as a coach, is to teach these young men not just the football skills the successful, but the virtues needed to be the men they are created to be on AND off the field as well. “Coach Lad”, as he is affectionately known, really tries hard at instilling in his team the idea of brotherhood and not being all for oneself …and everything that it requires. He desires that his guys use football as a means to grow as men so that when they’re off the field, they’re still living out a life of virtue. I recently helped give a workshop to some 60+ young men in high school at a youth Catholic conference. And this idea of living a virtuous life is totally cool and, really, a genuine expression of living out authentic masculinity. One of my buddy speakers for the workshop gave some personal experiences where he failed to be a man by not integrating virtues in his life decisions, and also experiences where he used virtues to be a man and do what is right, especially at his place of employment. I think When The Game Stands Tall really highlights the importance of living out virtues in everything that we do because we are called as men to be virtuous. You see, I struggle with living a virtuous life. It’s an everymoment choice, but I know I need to. I cannot have a sense of brotherhood if I am not first an authentic man. I cannot be who I need to be for others until I have grown the habit of living out virtues. This is the real struggle. And it’s worth it. What I also thought that was pretty cool is how Coach Lad handled the team post-streak. I mean, if I were in their cleats knowing that we’ve had a 150 win streak, I would be incredibly tempted to play my game as if it were all about the streak. His whole deal is about teaching his team virtues and doing what they need to do on the field, and the fruit of that should translate into a win. He even puts some of his guys in their place for expressing that it’s all about the streak or it’s all about breaking records. He really stressed that their success depends on doing what they ought to do and being virtuous on (and off!) the field. I think the best example of this in the movie is when a parent basically uses their player as a trophy-getter. In other words, the parent was all about the rewards of the game. But much to their dismay, their player learned that the game isn’t about winning or breaking records. And I’ll leave it at that. Too many times in my life, I’ve been all about the achievement of status. As I’ve been too focused on a goal, I’ve neglected doing what I need to do in order that the fruit of my effort results in achievement. 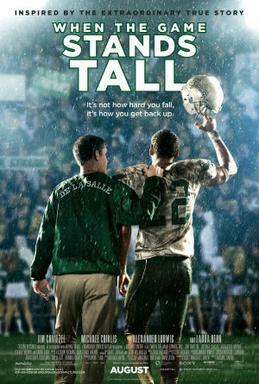 After watching When The Game Stands Tall, it helped remind me that life isn’t about the rewards but doing what I need and ought to do. And now a very brief review: acting isn’t totally awesome, but Jim Caviezel captures who the real Coach Bob Ladouceur is; football scenes are pretty epic and action-y; transitions in the plot were too fast in the beginning; and I dig the end credits. I haven’t been to a movie in a long while (ever?) that has really been, at least, inspirational to me in a practical way. I can start living out what I’ve learned from this movie almost immediately. And that’s cool. I highly recommend this movie for when it comes out at the end of August. It’s a good movie for those who enjoy football and really cool football stories. I think those who are coaches, teachers, and those who work in ministry should go see this movie because there is so much to pull from to be used as a teaching tool for players/students. I mean, I only covered a few themes and only covered them lightly! Coming to a theater near you, August 22.